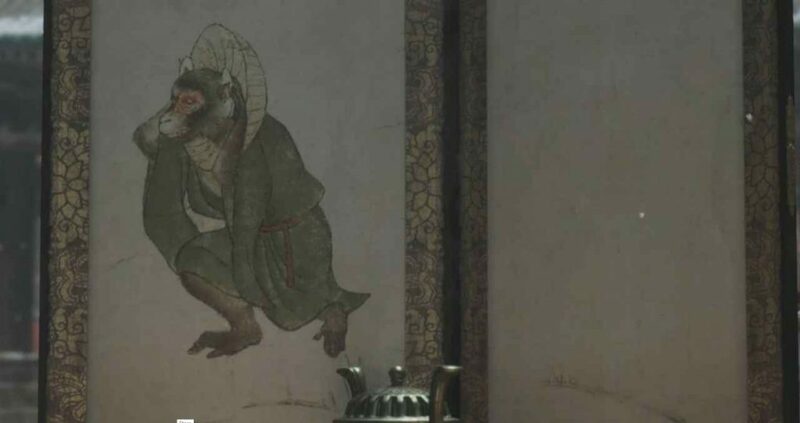 The Folding Screen Monkeys are the fourth boss in Sekiro: Shadows Die Twice. They are found at the top of the Senpou Temple, Mt. Kongo area. You can reach them by interacting with the bell on the table, in front of the ‘Main Hall’ Sculptor’s Idol. The Folding Screen Monkeys are not your typical boss. Instead, they are more of a puzzle. There is only one phase of this fight. However, due to the puzzle nature, it can last a while, as evidenced by the 20 minutes it took me to defeat them below. There are four separate monkeys to kill, each worth 25% of the healthbar. The Red Monkey will alert the other ones to your presence when it sees you. The Purple kimono-wearing Monkey has excellent eyesight and can spot you from far away. The Green Monkey can hear well, meaning it is hard to sneak up on him. Finally, there is a white monkey who is mostly just walking around. You can spot their footsteps as the glow as they walk around. At any point, you can ring the Illusive Hall Bell to reset all of the Monkey’s positions. I didn’t realise this myself until after I had beaten the fight. You can talk to the man in the centre, who will tell you all of the information I just told you. Once you kill a monkey a copy of it will spawn on each of the middle towers as a nuisance. They do not have to be killed and only take a few hits to go down anyway. At the start of the fight, you can actually turn around and kill the White Monkey straight away. For the Green Monkey, ring the bell in the centre to get it to spawn on the ledge just above you. Ringing the bell will stun it. Grapple up and take that one down. The best way to take down the Red Monkey is to spot it from the rooftops and sneak up behind it to perform a stealth kill. For the Purple Monkey, you will want to open the door in the left side tower. You then want to chase the monkey around for a bit. It will eventually return to this tower. 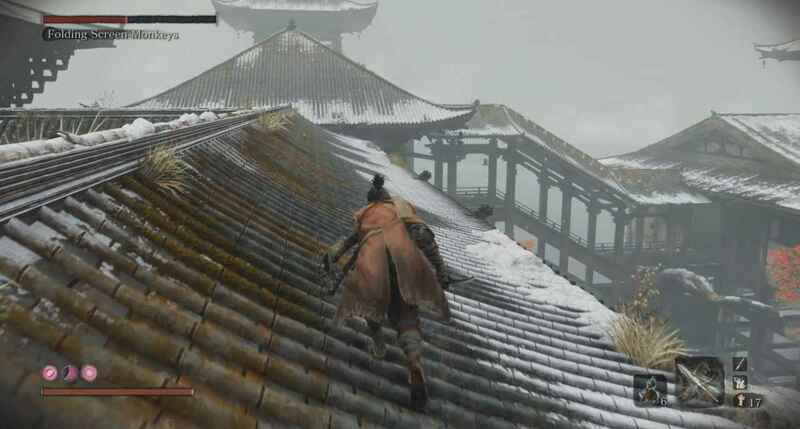 Now climb up to the roof and perform a jumping deathblow to complete the encounter. Credit to PS4 Trophies for these strategies. In my playthrough, I mostly just chased the Monkey’s around till I eventually managed to kill each one. Our walkthrough of Senpou Temple, Mt. Kongo is now up. You can check out our walkthrough of the Ashina Castle, Sunken Valley, and Abandoned Dungeon areas. Stay tuned over the next few days for more Sekiro guides.